The Maxxis All-Trak features a dual scooped tread knob to provide superior traction. The tyre also offers rugged shoulder knobs to aid in cornering stability. Speed rated to J 100 Km/h and EC E marked. They are designed for use in the most challenging conditions and have been used by Mike Penland in the GNCC race series as well as the Baja 1000. Multidirectional tread design offers traction in both muddy and sandy terrain. Aggressive shoulder knobs provide excellent side bite and grip. Multipurpose design offers versatile application options. The terrain is rough. The ride isn't. An EC homologated version of this model is also available in European markets. 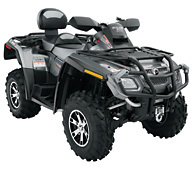 It's the most powerful and capable ATV out there, loaded with features ready for packing on miles and miles. And it´s all wrapped in a luxury appearance package that will draw admiring stares at any trail stop. Welcome to the new world of luxury ATVing - the Outlander MAX 800H.O. EFI Ltd. If you run your ATV on similar terrain for the majority of the time, and there is not that much of a climate change in the area of use, it is possible for you to continue the use of your standard ATV tyres. Nevertheless, if you intent to use your ATV on various types of terrains hilly terrain as well flat terrain - and in various types of climates, you can benefit from the numerous kinds of tyres that are available so your ATV will be more atuned your needs. Locating the proper type of tyres for your all terrain vehicle can increase both the safety and comfort of your riding experiences. What is the best way to determine when you need to purchase ATV mud tyres? Well, you will certainly require them if you intend to use your ATV in the mud. Figuring out what ATV mud tyres also means determining the right kind or tread. ATV mud tyres typically have deeper treads that are constructed to hold and adhere to the ground surface. If you are thinking of traveling along a mainly hard, flat type of surface, the treads of ATV mud tyres will usually be more of a hindrance. When looking to purchase brand new tyres for your all terrain vehicle, be certain that you get the width down right for your particular rims. If the tyres are too wide for the rims, they will fly off at some point. You have the option to pick from a flat type of tyre to a round one. There will be more contact with the surface of the road. If the tyre you are looking at is a round one it has the ability to cause the ATV to roll when you are in hard cornering. You also have the option to pick from a short type of tyre and a tall one. You will have to evaluate your personal driving style and your likely terrain you plan to drive on to determine this choice. You will get a softer type of ride as well as additional ground clearance with a taller tyre. You will get additional stability for hard cornering and at higher speeds with a shorter tyre. Lastly, comes the determination in regards to the tread itself. If you looking to stay with a single set of tyres, pick a tread that the main purpose is for general conditions. If you wish to drive in numerous, very different kinds of terrains, and if you have the money to indulge, then an assortment of tyres may be your choice. Available types of tyres include trail tyres, sand tyres and, of course, the ATV mud tyres. The first ATVs or quad bikes were made during the 1950s. These early models had six wheels instead of four. Honda made the first three-wheeled ATV in 1970, and were famously portrayed in the James Bond movie, "Diamonds Are Forever". Dubbed the US90 and, later, the ATC90, it was designed purely for recreational use. It featured large balloon tyres instead of a mechanical suspension. By the early 1980s, suspension and lower-profile tyres were introduced on quad bikes.The 1982 Honda ATC200E Big Red was a landmark model. It featured both suspension and racks, making it the first utility three-wheeled ATV. The ability to go anywhere on terrain that most other vehicles could not cross soon made them popular with US and Canadian hunters, and those just looking for a good trail ride. Soon other manufacturers introduced their own models. There are also 6 and 8 wheel models where the rider sits inside, known as AATVs (amphibious all terrain vehicles). These vehicles may float and are designed to go through swamps as well as dry land. These were around in the United States long before 4 and 3-wheeled vehicles were introduced (by Honda and other Japanese companies). Current brands of these machines include Argo and MAX. They consist of a fiberglas or hard plastic "tub" with low pressure (around 3 PSI) tyres and use a skid-steer steering setup. Though not as fast as other ATVs, they can be operated with precision at slow speeds, and, of course, have the ability to float. The spinning action of the tyres is enough to propel the vehicle through the water, albeit slowly. Outboard motors can be added for extended water use. Technically, these AATVs are not true ATVs by the ANSI definition of an all-terrain vehicle. Often they have steering wheels or control sticks rather than motorcycle-type handle bars and are intended for more than a single rider, in contrast to ATVs that meet the ANSI definition.